Modifying a template in Blogger is very powerful feature. It allows you to make significant modifications to your blog which helps your blog to distinguish itself from millions of other blogs. It also gives you ability to add interactivity to your blog. This article will show how to achieve that for both Desktop and Mobile Template. You change a theme by modifying CSS code in the template. If you are familiar with CSS and HTML , then modification of template code is best suited for you. Otherwise use Blogger Template Designer as it gives you ability to modify the theme without the need to deal with CSS and template code. It is located at Dashboard > Template. Once there, click on Customise button. Maybe you are not satisfied with the default layout and want to change it. For example by default, you can not add any gadget in the header part of the layout as there are no Add a Gadget links located there. Modifying template code solves that problem. Layout of this blog has room for 2 gadgets in the header. 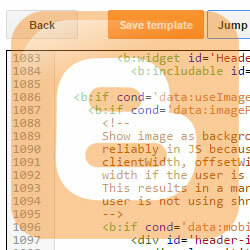 If you want to change the HTML output that the template generates, then you need modify widget code in the template. One reason for that would be to improve Search Engine Optimization. If you would like to spice up your blog, then adding various jQuery plugins will achieve that by adding their code into the blogger template. In most cases, you should add the jQuery code at the end of the template before </body> tag. Important! Backup your template. Before doing any modifications, you should always backup your template on your computer first just to be on the safe side. Go to Dashboard > Template and click on Backup / Restore button located on the top right corner and click on Download full template. Note:If you are interested in backing up whole site, not just a template, check my other article: How to make a complete backup of your blog. After you made a backup, you are now ready to start with modifications. Go to Dashboard > Template tab and click on Edit HTML button. You get an edit window containing template code where you can do all the necessary modifications. If you want to edit widget code, you can use Jump to widget drop-down menu to quickly locate the widget. Some modifications require you to find particular code in the template and since the template contains lots of code, you might find it difficult to locate that code. To help you with that, use some sort of text editor by copying whole template there and then use Find command. Note: I am personally using Notepad++, a free Code Editor that supports several programming languages including XML for our templates. Use Preview button to check the result of modifications. After you are satisfied with the result, click Save Template button. When you are optimizing your blog by directly modifying the template, you should also take into consideration the visitors that use mobile devices to visit your site. 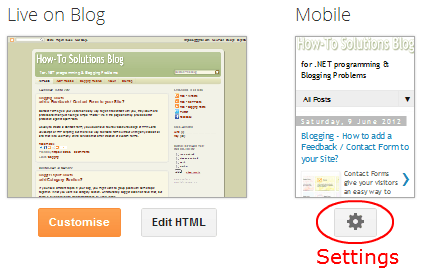 Modifying Blogger's template for mobile devices is the same as modifying a normal template (steps 1-5 above), except that you need to do one additional step. You need to set mobile template to Custom, otherwise you will not be able to see any changes you make in the mobile parts of the template. Click on Settings button which is located below Mobile. This will open new window and once there, choose Custom mobile template under Choose mobile template. Click Save and now your mobile part of the template is ready to accept any changes and additions that you make. To test your modifications, you don't need to check your blog on a mobile device, you can just add ?m=1 at the end of the URL and the browser will display mobile version of your site. In this article we examined why and how to modify blogger templates. This is a big topic, so the article also listed few links of resources you might find useful when modifying your template. If you think of any other resource that would be useful for blogger template modifications, feel free to suggest them and I might add them to the list. I hope you have found this post useful. Feel free to comment or share it on your social networks. Thank You for your info but i have tried and failed. please help me. I have noticed that you were looking for mobile template modifications. If you just want to fix style like colors or font size, then first find in the template CSS part that is located inside <b:skin> tags in the beginning of the template. Class selectors that start with.mobile are the one for mobile. Is there a way to move the adsense to be just after the blog post instead of having the share buttons in between? hi, all the colors in my website went crazy after some template changes I made. So it was a relieve that I found your post and who would have guessed it was just so simple. But I have a problem now....the header is not showing in mobile. Any suggestions? Thanks. Depending on the layout option, your header might not show up in mobile version. I have just made a post regarding this same issue Here. I hope you find it useful. Hi does anyone know how to enlarge and center the thumbnail pic on mobile template? And then the post snippet to follow below it. Hello, that is amazing tutorial. Thank you. But can you help me please? I have a custom template of desktop version and for mobile it was similar (color, background...) Suddenly something happened, and mobile version is now different. Background is white, texts dark.. I tried to restore it by changing templates, but nothing helped. Is there some way, to use main template and apply to mobile version? 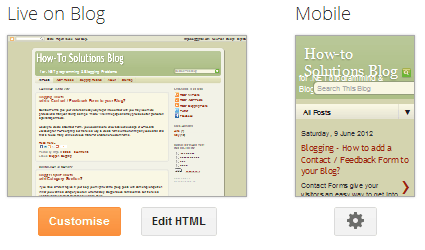 I tried to set background by tags in main template to CSS of mobile classes, but that didn't help. And one more question. Is there way, to put in mobile version some menu? Its very hard to find some post in history, if I dont't use archive or categories. Thank you very much and nice day. This looks as your site is using one of those predefined mobile templates and not a custom one. Yeah, it was very helpful. Thank you:) If I dont bother you yet, I have two little problems yet. If you want to help me again. In desktop main template, when I chose some label (tab) and go to these type of posts, label name in menu jumps up, right blue border is lost and font is smaller and maybe different. This was default in original template. I tried to find css, but without success. There are many "tabs" code, but didnt find this one. And second problem, or maybe just improvement. Is there a way to set selected link in my mobile menu to different color, so user would see, where he is in categories? I tried to set pseudoclasses like hover, visited, focus and so on, but it wasnt ok, perhaps because thats everytime new site, not the one with clicked link. I dont know how to do that somehow easily. But it is too difficult, let it go. How can I center my post title in mobile view? It shifts towards the left side instead of being at the center. Please need help on how to correct this. Unfortunately, there is no ".mobile-index-title" in my template. I want to add it as you advised but don't really know the particular place to add it. In Dashboard go to Template and click on Edit HTML button. Your template code will show up. Find .mobile-index-title and if you don't find it, locate <style> tag and inside it put that code from my previous reply. If you are not familiar with modifying template, I suggest you do a backup first. if you are not sure how to do that, check my other article about creating a backup on Blogger. You don't need to do a complete backup, just template backup should be enough. Don't really know how to start thanking you. My God will reward you abundantly. Hello, I have a side bar with page widgets on my blog. The web version works perfectly displaying page title and the link to the page directly underneath, e.g. When I go onto the mobile version, however, all i can see is the word "Home" instead of either the Page name or the link name. Only after clicking on one of the "home" buttons I have a choice to click on either another "home" or "facebook". Links work all fine but it is rather ugly to see "home" 4 times at the top of the mobile page. I am a little surprised by this as I specifically unticked showing "home" in the gadget dialogue box. I wrote an article about your issue. You will find there step by step instructions on how to fix this. My query is - In mobile version, currently the tabs of the blog are coming in drop down list. i would like all tabs visible all time very unlike drop down, how may i do it? 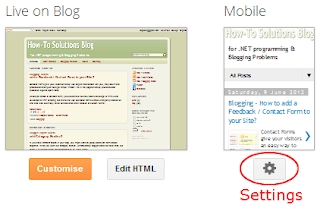 Check my other article about Modifying Blogger Pages Widget on how to do that. Quick question, I hope you can help. I have chosen to have the custom mobile theme as a background. But when I view my blog on my phone, the background theme/picture only covers half the screen unlike the web version. As you scroll down on your phone the theme doesn't follow all the way through. Do you know how I can fix this? when I preview the mobile version on the laptop it seems to be fine. I got a weird problem on mobile. I have a page that I wrote as html and its rather long. when loaded on mobile all I see is a blank page until I start scrolling down and only then I can see my page. Any ideas? Yes, your blogger site really is acting a little strange. The problem seems to be that when appending ?m=1 to the end of the URL, the mobile version is not shown. Here is some random page from another blogger website and if you do the same there, it loads as you would expect. After appending ?m=1, mobile version of the site is loaded. Only thing I can think of is maybe under "Theme > Choose mobile theme" you have "No. Show desktop theme on mobile devices." option selected. I dont see that option at all. After some digging it seems newer blogger themes do not have part of template for desktop and part for mobile, but use responsive layout instead. So missing button for mobile customization is not the problem. So you don't have this when you click on "Theme" option in the Dashboard? Can you provide me with the screenshot of what you have? no. how do i send you a pic ? On the Contact page, you can find my email. Send it there. As you can see, i've got two navbar and the first burger isn't working and my main menu's appareance looks like the two navbar. I've download this theme (named Rosemary) and i don't know how to fix it. Go to Dashboard, > Layout. Find the "Link List" gadget. Click "Edit" on that gadget which opens the "Configure Link List" window. Click on "Remove" button to remove the gadget from the layout. Your guide really really helped me in making my blogger mobile template to reflect the changes I made in my blogger desktop template. no gear icon under mobile what to do? Need help. Well actually trying to help a online friend with her blog. I haven't used my blog for years so am a tad rusty. lol. I never had my blogs set to mobile. I don't have a mobile phone and forgot about the people that only access using their phone, but back in 2009 when I used my blogs that wasn't such a 24 hour a day thing...now it is. She would like her blog to be accessed by both computer and mobile but I am clueless as to how to help her do that. What platform does her blog use? Is it on a Blogger platform or is something else like WordPress? She is using the Blogger platform. Sorry I should have stated that in my original posting. On mobile devices, show a mobile version of your current theme. Yes. Show mobile theme on mobile devices. No. Show desktop theme on mobile devices. Select "Yes" and click "Save". To test the website under mobile, just append /?m=1 at the end of the URL. show him how to build one. Thanks for much for all you do for all of us that get stumped. Greatly appreciated.